Social activism or social slacktivism? Can online social activism be meaning and worthwhile? I think the short answer is yes! Of course. There are meaningful examples of social activism online however I do feel this can quickly become overshadowed by social slacktivism which is becoming more and more visible on my own social feeds now that I’m more aware of armchair activism and tuning in. Take the #bringbackourgirls movement for example. 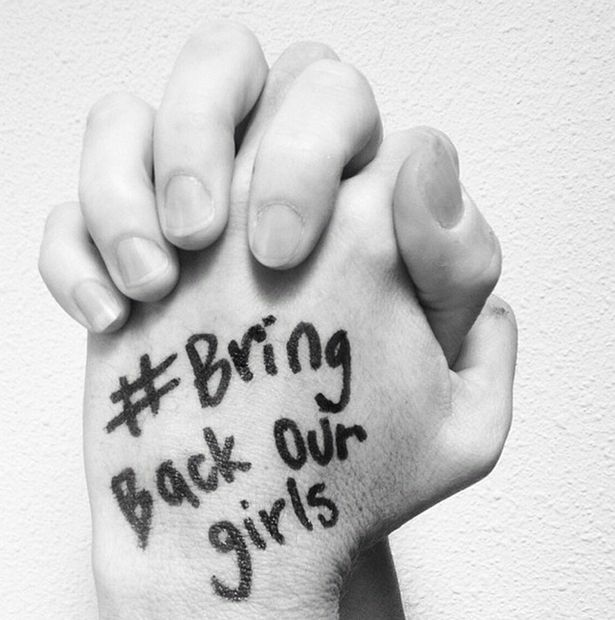 Maclean’s article “The Problem with Slacktivism” argues the #BringBackOurGirls campaign is the” latest disgrace from slacktivists, those who support good causes by doing very little, and achieving even less. This leads me to question how many people draw attention to themselves during the Movember campaign or the Ice Bucket Challenge actually fail to donate to the cause, while gaining the positive attention they are looking for. To counteract this, I do believe in many of these causes that go viral and explode on social media draw an impressive amount of attention and awareness, and as a result of the buzz generate more donations than they perhaps would have without the use of social media and doesn’t that account for something? Katia’s argument made rethink my own use of social media and social justice issues. Although I visit my social media feeds often to check the news and occasionally share special events to stay connected to friends and family, I seldom use it as a tool for social activism. Could I be doing more? Clearly the answers is yes. Although I will sometimes share a post outlining a cause I believe in, I very rarely involve myself in political posts and discussions. But why? Was I worried about whether people would disagree or judge? I’m not sure – I think partially yes. There is an aspect of fear of judgement. I haven’t made the choice to use social media in this way. I could relate to blogger Debs post Why I’m Scared to Express my Opinion Online who commented on the “barrage” of tweet replies a friend received after voicing her opinion online. Although I’ve never experienced this barrage, I often choose not to comment to avoid it. She speaks about avoiding the Twitter drama, which is something I feel holds me back from posting my opinion. I don’t want to get caught up in an online battle and it seems as though people love getting into these heated online debates that really aren’t my personality or style. Do I need to become braver? Do these online battles of opinion make a difference? Katia’s post made me consider my privilege, along with the responsibilities I have as an educator to model active digital citizenship online. 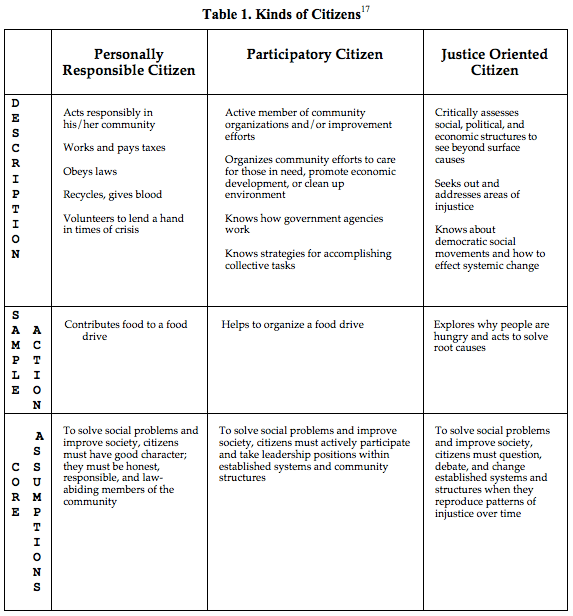 In our second reading from Katia’s blog posts titled “What Kind of Digital Citizen?” was an informative read for me, particularly reading into Joel Westheimer’s framework about “Kinds of Citizens”. as I immediately thought of my learning project which combines social media use in the classroom using a classroom Twitter account and implementing a digital citizenship curriculum. I do believe we have a responsibility to teach students how to be responsible citizens and move them along the continuum of being a “Personally Responsible Citizen” who volunteers to someone who advocates organizes, and seeks answers to areas of injustice. Right now, my project is focused on issues such as “The Power of Words” online and more basic, yet still important, aspects of technology use. I think it’s important to remember that students don’t have to stay in this “box” of general citizenship and to think outside the box in terms of also teaching more justice driven citizens. I think I model digital citizenship but in terms of social activism in an online space, I’m not sure I’m there yet and to be honest I’m not exactly sure how to model this well. I believe all teachers should share responsibility as educators to provide experiences for students to explore issues of injustice and ways we can help both online and offline. This should happen across all grades so once these students have a foundation of citizenship they can continue to build on this and push outside the box of a personally responsible citizen towards becoming “Justice Oriented” leaders in the community. This is an exciting prospect and I would like to see some examples of how classrooms and teachers are doing this. Do you keep your opinions to yourself or are you an open book online? How do you model social activism in the digital world? This made me think a lot. I am wrestling with the idea that my not commenting on something is by default stating it is not important. This places a huge amount of responsibility on teachers to comment on everything of importance, and this simply is not practical. We I write my post later I will have to explore that. Thanks for something to think about. Great post! I agree with Chris’s observation that it places a lot of pressure and responsibility on us as educators to speak up on all social issues. My argument is that in order for online social activism to be meaningful and effective we need to be educated on the issues. I believe that means all sides of the story. To Chris’s point, I do not think that is feasible. Having said that, I believe incorporating social issues that my student’s are passionate about into the courses I teach in post-secondary, and then becoming active digital citizens to support that, would have more impact. I also share the same sentiments as you with respect to commenting on politically charged or controversial issues online. Although I may find them a valuable cause to raise awareness on or to rebut blatant false impressions, I hold back. Mainly because of fear of judgment, but also I don’t feel educated on most issues enough to enter that debate. I have also found online audiences hard to ‘read’. Perhaps this is where my skills in online communications need to be sharpened to become more of an active digital citizen. I really like you identified people who demonstrate fear of judgement for sharing their opinion on hot topic issues and social justice causes. This is something many teachers can relate to in the fear of judgement from parents and most often their employer. This has been me! Up until this point I have really just tried my best to keep a neutral position online by not saying…well much at all! This week as well as your post has made me realize that this is not the best place to be and that by saying nothing I am in fact saying a lot! Your post provoked a lot of thought in me!